We posted news from Venice Beach (earlier posts) as it came in but today the videos from the evening started to come online so here’s an update! 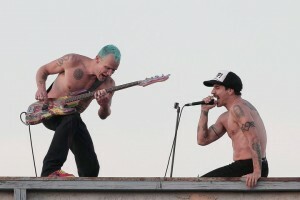 RHCP played Venice Beach on Saturday 30th July; they performed on a rooftop at Muscle Beach and everyone in the surrounding area was treated to a free RHCP show.The performance was filmed by a crew with a massive crane (there were issues over it being parked illegally & without licence; the LAPD were called in to deal with it and the crane was moved, problems were sorted and the concert shoot went ahead! Account HERE). We’re not exactly sure what the video shoot was for; the video (as yet unreleased) for The Adventures of Rain Dance Maggie is supposed to have been completed but TAORDM was filmed as part of the shoot leading to specualtion that the video for the song might be getting an update/new treatment or it could be that theywere recording the song for other promotion, it was part of a shoot for a second video but it is all speculation at the time of writing. Anthony was wearing a very nice black suit with vibrant multi-coloured silk lining; Josh appeared to be all in black, Flea was sporting a new funkadelic design Fleabass and Chad sat thumping the drums while the rest of the band leaped around the roofspace! Over 130 photos of the even have come out on media photo agency sites, there are fan photos, etc. so we’ve made a selection of the best (are a lot of very similar photos) and added them to a photo gallery.